Trusted Safety Features of the 2019 Ford Transit Connect | Richardson Ford Inc.
At Richardson Ford Inc., we're ready to show you the advanced safety features that are incorporated into the 2019 Ford Transit Connect. You'll be able to drive around Standish confidently knowing that you and your passengers will be protected. Being able to see behind your vehicle as you're backing up is important. All models of the Ford Transit Connect come with a clear rearview camera that will make backing up safer. It will be easy to get into tight parking spots, hitch up a trailer, and keep from hitting anything. An audio alert system is also available on some models. 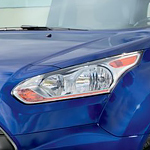 To help you see in low-light conditions, the HID headlamps will turn on automatically as it starts to get dark. By also turning on whenever the windshield wipers are activated, they can help keep you visible in rainy and wet conditions.